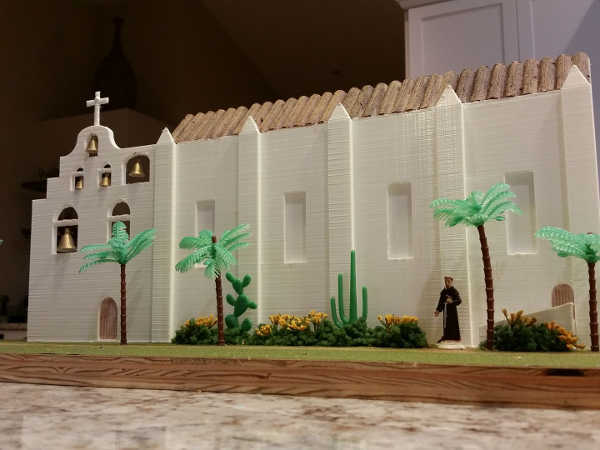 Like many parents of school-age children in California, Troy Peterson’s daughter came home needing help with her 4th Grade project: Build a model of a California Mission. 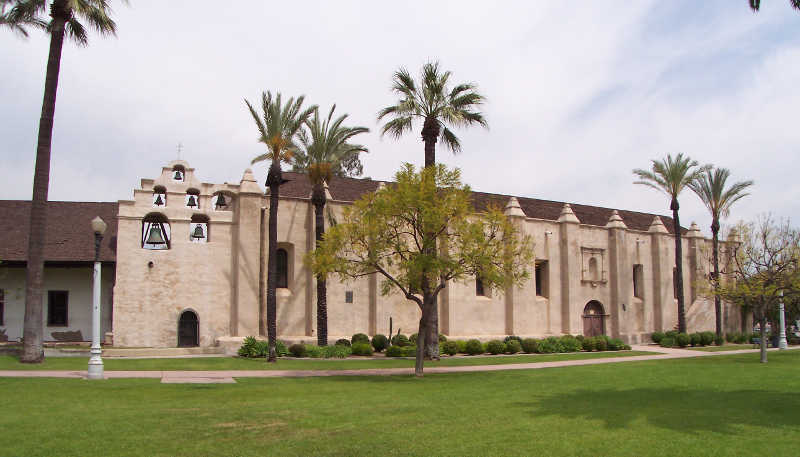 Troy’s daughter was assigned Mission San Gabriel Arcángel, an elaborate historic landmark in San Gabriel, California. Founded by Junipero Serra in 1771, the mission is known for its scenic buttresses, towering walls, and a distinctive “bell wall” featuring six mission bells. Mission San Gabriel Arcángel served as the city’s center and is credited with playing a central role in the area as the city of Los Angeles grew into the metropolis that it is today. The Mission’s distinctive buttresses and tall, narrow windows make the landmark unique…and fun to 3D print. Put simply, this was not going to be a simple 20-minute diorama. But Troy was up for the challenge. A bonified “MacGyver Dad,” Troy works in sales and marketing for BJB Enterprises, a manufacturer and supplier of thermosetting polyurethane, epoxy and silicone systems. With his expert skills in 3D printing, casting, and mold making, Troy took one look at his daughter’s assignment and immediately thought, “Build a Mission from sugar cubes and cardboard? That is so 20th century!” Instead, Troy set out to make a 3D-printed model of Mission San Gabriel Arcángel. Build a mission from sugar cubes and cardboard? That is SO 20th century! Troy started by trying to find models online that he could use as a starting point for the 3D-printed school project. Despite his search, Troy couldn’t find many Mission projects besides one on Thingiverse and some architectural models on Google Sketchup. None of them were very helpful, so Troy and his daughter had to design one from scratch. Using TinkerCad, Troy helped his daughter design a 3D model of the mission, which they then sliced into G-code for printing. They then printed the model on an AXIOM Direct Drive 3D printer in a variety of materials to make the mission look more realistic. Not your mother’s diorama. 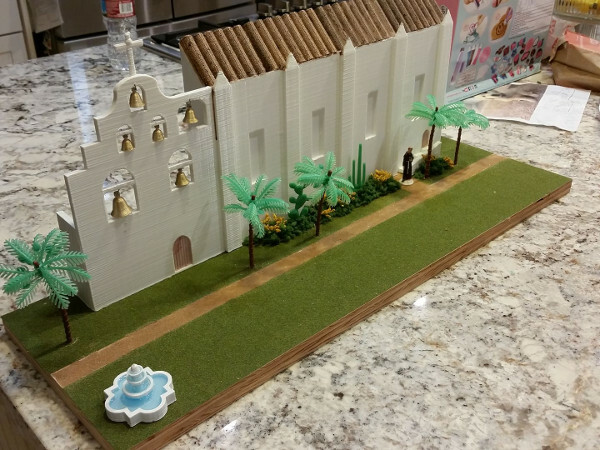 Troy Peterson created a 3D-printed model of a California mission for his daughter’s 4th grade project. The model was printed primarily in PLA, but Troy didn’t stop there. To really bring the 3D-printed school project to life, Troy selected different materials for other parts of the model. To simulate the mission’s earthy red roof, Troy used LayBrick, a material with an appealing stone-like texture. For some extra brightness and shine, PETG was used to 3D print the mission bells. Once the model was complete, the father/daughter team started decorating using miniature plants, grass, and a figurine purchased from a local craft store. The cleverly designed walkway was created by simply using Elmer’s glue sprinkled with sand. Careful details like PETG bells, miniature trees, and a sandy walkway brought the project to life. The finishing touch? A 3D-printed fountain holding Water Clear casting polyurethane tinted with a touch of blue dye to make it look like real running water. Someone obviously deserves a pretty great Father’s Day gift! To learn more and even create one of these models for yourself, Troy kindly shared his design on Thingiverse. This entry was posted in 3D Printing for Education, Blog. Bookmark the permalink.